RE: What are the standard allocations of stationary concrete batching plant? 6. The installation waterway, additives pipeline and admixtures pump machine fixed on a storage bin. The concrete mixer should be installed on a flat site, and the legs of the mixer to should be put on hard concrete foundations. The pit should be higher than the ground to avoid that the water may flow into the pit. 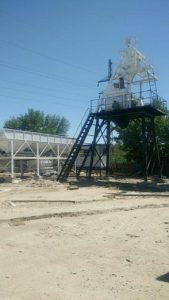 concrete mixing plant has appeared in many small and medium-sized projects. When selecting the site of concrete batch plant, make sure that it is close to the stone yard and the sand plant, and it should be set in a place where it is away from residential area but are rich in water at the same time. Users should pay attention to avoid the ground and underground cable, power supply or communication cable in selecting the site. It is best to use wheel loaders to supply all type of raw materials. If the site is big enough, users should select a flat belt conveyor that is lower than 18 angles. The flat belt conveyor can largely reduce the equipment purchase cost, but also improve the hopper conveying method. If the area is limited, one can think about the large angle (usually 40°-50°) ribbed belt machine. However, sand and gravel is easily stick onto the outer side of conveyor under the humid environment, which may affect the batching ratio of concrete, and users should take all factors into consideration. The cumulative measurement has one scale of stationary concrete batching plant, and there are often 2 to 4 scales in separate weighting. In order to ensure the production quality of concrete, users should select the right weighting method with actual condition.